Saunas are a perfect addition to households aiming to improve their health. For those who may be wondering what saunas are, these are small rooms designed to heat up at high temperatures when controlling the humidity level so that you can benefit from better health. In particular, Saunas allow you to experience dry or wet heat therapy which results in a better and more efficient heartbeat as well as a reduction in the blood pressure. In addition to that, saunas are associated with detoxification, weight loss, improved blood circulation, better cardiovascular performance, relief of stress/joint and muscle pain, among other health benefits. For such reasons, it is crucial that you invest your money in purchasing the best sauna for you to gain the listed benefits and much more. Given the variety of saunas on the market, today I will help you narrow down to the top 10 best barrel saunas in 2018. Note that the barrel type of saunas is a perfect pick when you want to gain the most out of sauna therapy due to the cylindrical shape that ensures a continuous air circulation while eliminating the need for more space and the energy required for the sauna to heat up. So, consider picking any of the reviewed products so that you can gain the maximum benefits of using a sauna. Enjoy long steam hours once you install the Allwood Barrel Sauna. The sauna features walls that are made using 1-5/8” thick slow grown Nordic Spruce to enhance durability. Its length measures 78.7” while the diameter is 6’8” to enable eight adults to sit comfortably. The barrel includes two windows on the back so that you can get an ample amount of light. More so, there are separate dressing rooms meant to provide enough space for storage. You can expect the sauna to come with roof shingles meant to enhance its lifespan. However, note that you can have the shingles eliminated and the price discounted if you are in need of a barrel that will install in covered areas. The Allwood barrel sauna comes in a kit that consists sturdy front/back walls, a heater guard, Finland-made Harvia M3 wood-fired sauna heater, stainless steel chimney, bitumen shingles, four industrial-grade stainless steel bands, floorboards, tinted glass door, all seating elements, among others. Also, the kit includes a porch that shields it from the rain and sun and three 70” support cradles that make it easy for you to elevate the structure from the ground. Next, we have the RDX barrel which is an ideal choice for those looking for a smaller barrel saunas. The unit measures 1800mm x 1800mm enabling it to accommodate 2-6 persons. It is made of Canadian Western Hemlock which is 1-3/8” thick to enhance durability and better heat retention. You can expect the barrel to come when pre-assembled to enhance ease of installation. Furthermore, the barrel comes with two 70” support cradles making it easy to elevate from the ground. Besides the two cradles, the kit further includes stainless steel hinges/fasteners/bands, a tempered/tinted glass door, a Finland-made Harvia electric sauna heater, front/back walls, bitumen shingles, heater guard, seating elements, an interior light, among others. 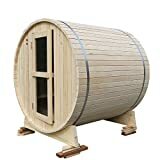 Do you define the best barrel sauna as a unit that will last a lifetime with proper care and maintenance? If so, the Canadian red cedar sauna is here for your taking. The sauna is designed to fit three people at a time making it even a better choice for individuals looking forward to purchasing small saunas. It comes with FIR FAR infrared carbon fiber heating panels which heat up to 140 degrees Fahrenheit. This makes the barrel sauna a great choice when you want to benefit from more profound and even tissue heat. Eliminate the toxins and impurities in your body once you allow the RGX barrel sauna to deliver a sauna massage. 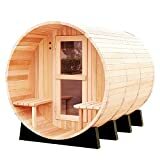 The barrel sauna measures 1800mm x 1800mm which is a perfect size for use with four adults. It is made using Canadian Western Hemlock which is 1-3/8” thick to enhance durability and better heat retention. You can expect the sauna to come with two 70” support cradles for easy elevation from the ground. On top of that are two-industrial-grade stainless steel bands/hinges, front/back walls, an interior light, seating elements, tempered/tinted doors, bitumen shingles, separate intake/outflow air vents, among other items required during installation. Constructed using a Grade-A Finnish pine from Finland, this is one of the saunas to obtain when you are in need of a barrel sauna that is built to last. The pine is 1-3/8” thick to assure you of better insulation and thus better heat retention. What’s more, the sauna measures 6’ (L) x 6’ (D) making it suitable for use with four individuals. The sauna comes in a kit that includes a tempered/tinted front door, bitumen shingles, cup holder, thermometer/hydrometer, two wooden backrests, 6KW sauna heater with lava rocks, interior light, sand timer, robe hook, among others. Take your sauna experience to the next level once you get this sauna kit. The kit features a 1-5/8” Nordic spruce construction to enhance durability and better heat retention. More to that, it includes a Harvia M3 wood-fired sauna heater that delivers different levels of heat. In this case, you can choose the higher level so that the heater can deliver high temperatures or the lower level that enables the heater to release a lower amount of heat. The barrel sauna comes with a kit that consists of windows, seats, roofing materials, doors, and high-quality wood-fired or electric heating systems. The seat has a 6’7” length that enables you to lie down comfortably. The barrel is suitable for use with 6 to 7 adults, thanks to the spacious design. As we can tell from the name, the Almost Heavens sauna can convert your experience into one that you will forever admire. The sauna is handcrafted in the USA to guarantee a long-lasting performance. It measures 71” (L) x 39” (W) x 71” (H) so that it can accommodate two people at a time. The barrel features preassembled roof and wall sections making it easy for two people to assemble. You can expect the Sauna to reach 150 degrees Fahrenheit in 30 minutes and 190 to 195 degrees Fahrenheit since it comes when equipped with a 4.5kW steam heater. The barrel sauna comes with a bench, ladle, tempered glass door, bucket, stainless steel heater/ fastener/ hinges, and a thermometer/hygrometer to enhance fast and easy installation. 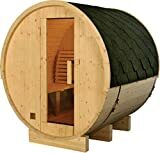 Next, we have the RGX barrel sauna. The sauna is made using a 1-3/8” thick Canadian western hemlock to enhance strength. It measures 1800mm x 1800mm enabling it to accommodate 4-6 persons. The sauna can reach high and stable temperatures for an ultimate relaxation. You can get it as the answer to a barrel sauna that is easy to assemble since it comes when preassembled. Furthermore, the sauna comes with two 70” support cradles that enable one to elevate it from the ground. Besides the cradles, there are stainless steel fasteners/bands/hinges, a heater guard, an interior light, bitumen shingles, tempered/tinted glass door, seating elements, a Finland-made Harvia sauna heater, among others. Constructed using grade-A Canadian pine wood, this is one of those saunas that make a great choice for an affordable and quality barrel sauna. The unit measures 6’ (L) x 6’ (D) enabling it to accommodate four adults. Moreover, the barrel comes with a 6kW sauna heater with lava rocks to enhance efficiency. You can get the barrel when you want to benefit from an ultimate sauna experience due to the 1-3/8” thick quality wood that serves as a great insulation barrier. Moreover, the barrel comes with a water bucket, thermometer/hydrometer, and a ladle for easy installation and convenience. Another Canadian barrel sauna is this red cedar wood sauna. Unlike the former that features pine wood, this sauna features a cedar wood which is even more durable and with better insulating power. 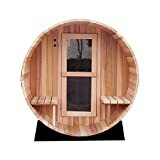 The sauna features a 6’ size which enables it to accommodate four people at a time. What’s more, it includes a 6kW sauna heater with lava rock for better efficiency. The sauna’s wood is 1-3/8” thick to enhance better insulation. The unit comes with a ladle, thermometer/hydrometer, and a water bucket to enhance convenience. 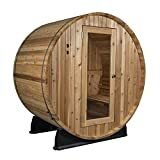 Once you decide to invest in a sauna, you will not go wrong when you pick the top 10 best barrel saunas as reviewed above. Note that these products come at reasonable prices and designs meant to provide you with the most benefits of a sauna therapy. As a result, you can be sure to gain the best returns out of the money you invest.